Depending, of course, on whether anything but life can generate a lot of oxygen. The search for extraterrestrial life is fairly synonymous with the search for life as we know it. We're just not that imaginative—when looking for other planets that could host life, we don’t know what to look for, exactly, if not Earth-like conditions. Everything we know about life comes from life on Earth. But conditions that clearly favor life here—liquid water, surface oxygen, ozone in the stratosphere, possibly a magnetic field—may not necessarily be prerequisites for its development elsewhere. Conversely, their presence does not guarantee life, either. So what can we look for that's an indication of life? Most (about seventy percent) of the stars in our Galaxy are M dwarf stars, and many of them have associated planets. 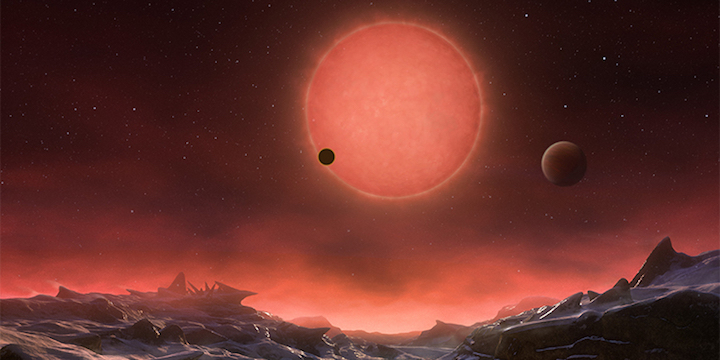 The search for signs of life has largely focused on these planets, primarily because there are so many of them. However, the environments do not seem to be especially welcoming. Because M dwarf stars are dim, the hospitable zones around them are very close to the star. As a result, the planets get stuck in a gravitational lock: their orbital period and their rotational period are the same. This means that (just like our moon) these planets always have the same hemisphere facing their sun. In addition to light, this perpetual-day side is constantly barraged with X-rays and extreme ultraviolet radiation, and the whole planet is subject to forces that would drive off its atmosphere. Could life thrive, or even ever get a toehold, in this type of environment? “The long-term evolutionary consequences of such conditions are topics of active debate,” writes astronomy PhD candidate Paul Dalba in a recent Perspective piece in Nature Astronomy. Instead of looking for life among the many Earth-size planets orbiting M dwarfs, Dalba suggests we look at the Earth-size planets orbiting Sun-like (G-type) stars. There are only about 10 percent as many of these, but he thinks they might be better bets. And instead of looking for conditions that might support life, Dalba suggests looking for biosignatures. Specifically, atomic O+ ions at about 300km up. The atmospheres of Earth and other planets contain neutral gas molecules, but also the ions and free electrons that result when these neutral gases absorb photons from the Sun. Many of those ions accumulate in (surprise!) the ionosphere. Earth’s ionosphere—and crucially, within the Solar System, only Earth’s ionosphere—has these atomic O+ ions. Like a lot of them, they account for over 90 percent of the ionic species up there. Like Earth, Venus and Mars are small rocky planets; they have permanent atmospheres like Earth, and their atmospheres are exposed to the same solar radiation as Earth’s. Data from the Pioneer Venus Orbiter and the Viking descent probe on Mars show that they have very similar ionospheres to each other—which don’t contain a lot of atomic O+ ions. Know what else Venus and Mars are missing? Photosynthesis. Dalba’s contention is that photosynthesis on a planet’s surface, which generates a surfeit of molecular oxygen, is the only thing that can account for these atomic O+ ions in a planet’s ionosphere. The mere existence of life throws a planet’s atmosphere out of chemical balance. O+would be a neat biomarker because there isn’t a numerical cutoff required—just the dominance of O+ among the ionic species in the upper atmosphere would indicate “thriving global biological activity” on the planet below. Dalba claims that Venus and Mars act as negative controls, demonstrating that planets like Earth but lacking life don’t have this O+ layer. Some may think that continuous volcanic activity on the surface could also generate enough oxygen, but Dalba doesn’t. Chemistry involving water and UV light can also release oxygen. But the amount of water on Earth is insufficient to account for the requisite oxygen content, so he thinks that the presence of water on other planets wouldn’t make enough oxygen there either. Alas, at this point we don’t yet have the technology to assess the ionosphere of exoplanets for such a biosignature. Dalba concludes his piece with a plea to “the optical and radio remote sensing communities” to get to work on inventing the detectors that might be up to the task.